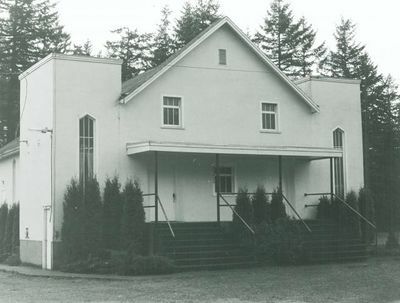 The Peardonville Mennonite Church in [[Abbotsford (British Columbia, Canada)|Abbotsford]], [[British Columbia (Canada)|British Columbia]] began services in 1951. 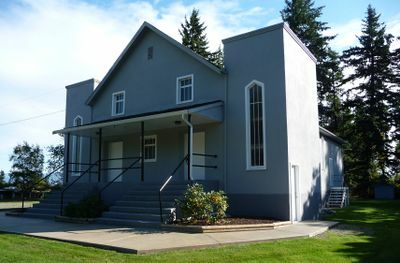 Initially the church (called Peardonville Mennonite Mission) was established as a Sunday School outreach of [[West Abbotsford Mennonite Church (Abbotsford, British Columbia, Canada)|West Abbotsford Mennonite Church]] under Tina Loewen to accommodate those families settling along the U.S. border in the South Aberdeen area. This work eventually developed into a preaching station, with services held in the Peardonville Hall. In February 1952 a group of 15 members unhappy with [[Epp, Heinrich M. (1904-1958)|H. M. Epp]]’s leadership at West Abbotsford left to start a new work at Peardonville. The church organized on 17 March 1952 with 28 members under the leadership of Johann Goerz and assisted by Jacob Berg. A building program was begun in 1952 with the construction of a basement 30 ft. by 60 ft., completed in 6 months. Peardonville Mennonite Church, ca. 1980. The former Peardonville Mennonite Church, 2009. Thiessen, Richard D. "Peardonville Mennonite Church (Abbotsford, British Columbia, Canada)." Global Anabaptist Mennonite Encyclopedia Online. November 2011. Web. 25 Apr 2019. http://gameo.org/index.php?title=Peardonville_Mennonite_Church_(Abbotsford,_British_Columbia,_Canada)&oldid=126925. Thiessen, Richard D. (November 2011). Peardonville Mennonite Church (Abbotsford, British Columbia, Canada). Global Anabaptist Mennonite Encyclopedia Online. Retrieved 25 April 2019, from http://gameo.org/index.php?title=Peardonville_Mennonite_Church_(Abbotsford,_British_Columbia,_Canada)&oldid=126925.